Interpreting the meaning of algebraic expressions. Before the lesson, students work individually on the Notebooks and Pens task. 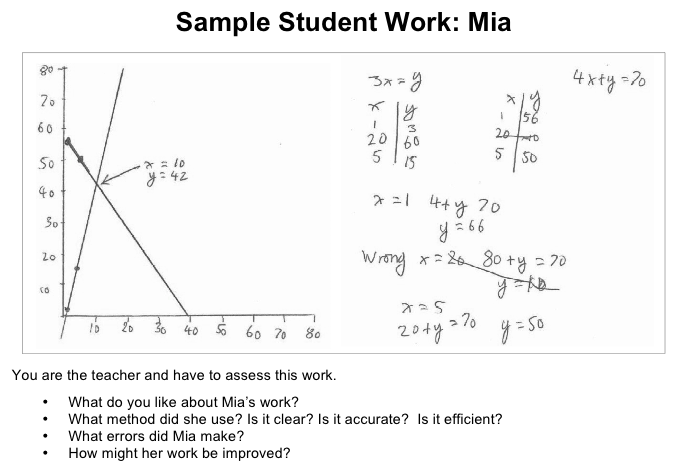 You then review their work and create questions for students to answer in order to improve their solutions. During the lesson, students work alone on a new task involving interpreting and solving two equations in two variables. They discuss their solutions in small groups before producing a joint solution. In the same small groups students evaluate some sample solutions to the task. Finally, in a follow-up lesson, students use what they have learned to revise their work on Notebooks and Pens. Each individual student will need two copies of Notebooks and Pens and a copy of School Fair. Each small group of students will need a large sheet of poster paper and an enlarged copy of the Sample Responses to Discuss. Graph paper should be kept in reserve and used only when requested. A projector resource is provided to support whole-class discussions. 15 minutes before the lesson, a 75-minute lesson (or two 40 minute lessons), and 15 minutes in a follow-up lesson. Exact timings will depend on the needs of the class. H.A-REI: Solve systems of equations.